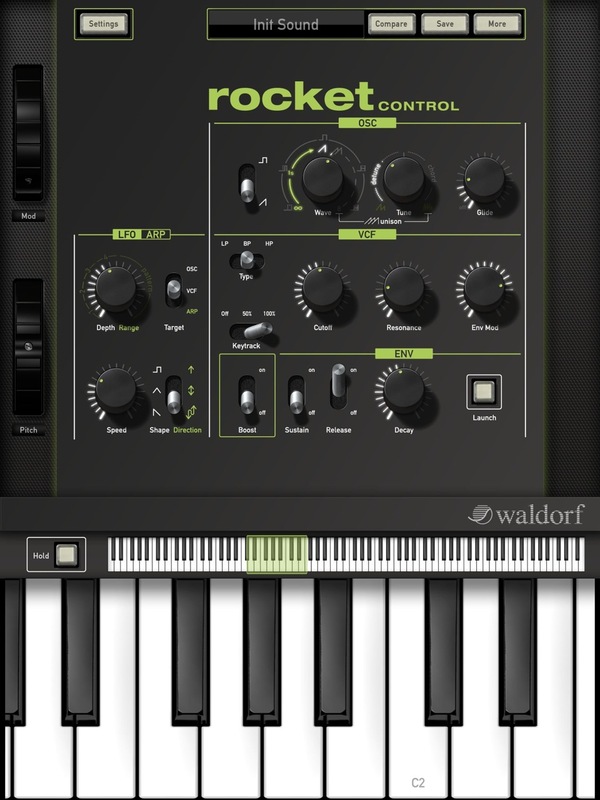 Rocket, Hybrid synthesizer from Waldorf. 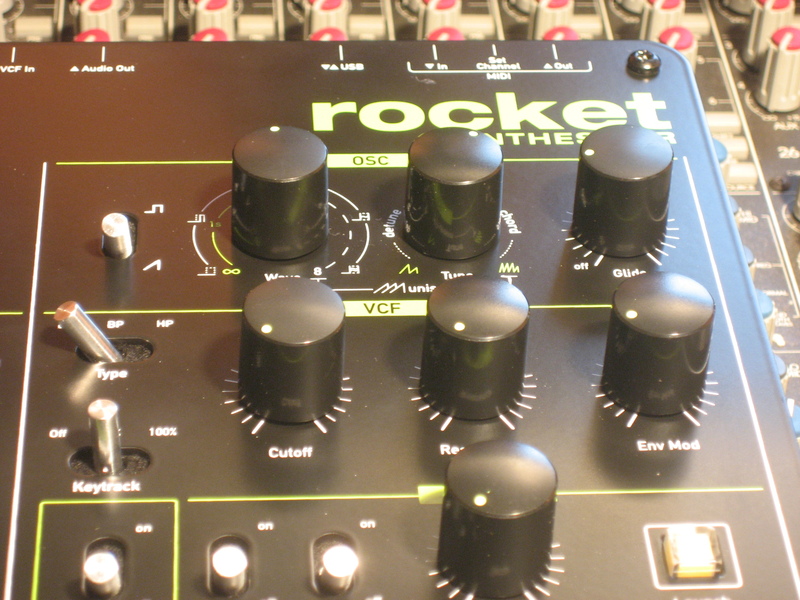 While we impatiently waited over a year for the Pulse 2, this small module named Rocket came out offering us an open sound buffet in early 2013. Fire it up! 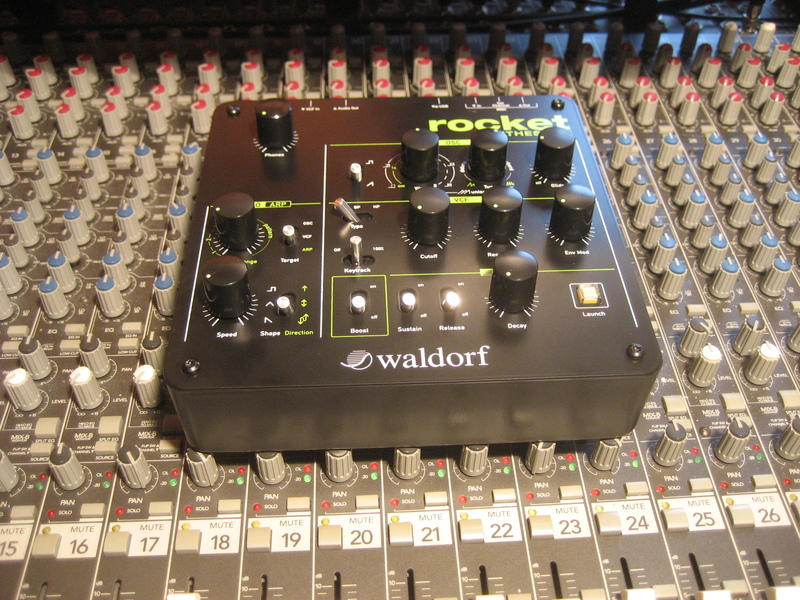 Several weeks before Frankfurt 2013, we asked for information about the availability of the Pulse 2 and Waldorf surprised us with a small modular synth with an ultra compact price tag. Enter Rocket. 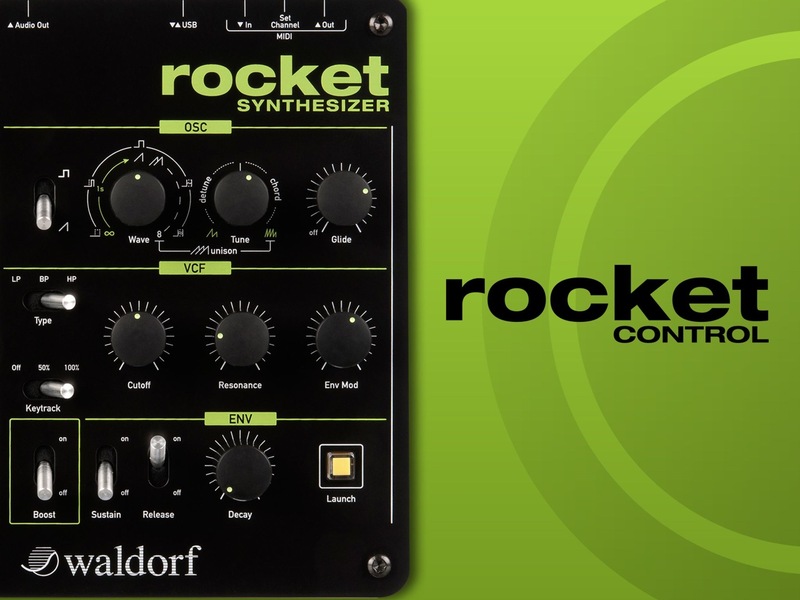 Totally different in conception to the Pulse 2, it offers an elaborate oscillator and a true analog filter for a couple hundred bucks. Let's see what the other elements are for and how it sounds. The Rocket uses the same color code as the Pulse 2: green letters on a black background. However, the shell is made out of a very rigid plastic, only the top is of metal. The module is stocky (7.5" x 7.5") and resembles a cobblestone once sitting on its pads. 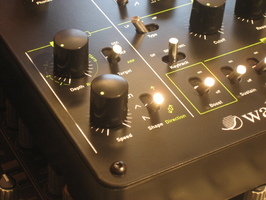 The control panel is rather uncluttered: ten knobs, eight switches (two or three-position) and a LED button (Launch) that can be used to trigger sound without the need of an external keyboard and to visualize MIDI activity. The pots are big enough, but wobbly at the axis; the toggle switches are pretty sturdy. The four sections can be easily identified: oscillator, VCF, VCA/envelope and LFO/arpeggiator. Everything is pretty clear once the exotic oscillator controls are understood. Among the pots there's a headphones volume control that doesn't affect the line output, which doesn't have a volume control itself... an odd choice indeed! On the rear panel, we find only the indispensable: MIDI input/output doubled with a USB port, VCF IN (line input on 1/4" jack) to process an external signal (nice! ), audio line output (1/4" jack) and headphones output (minijack). 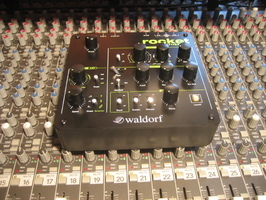 The USB port has two roles: MIDI and power supply, either via USB or the USB PSU supplied. And let's not forget the small switch at the back to change MIDI channel. But there's no on/off power switch. Nothing transcendental besides the audio input. 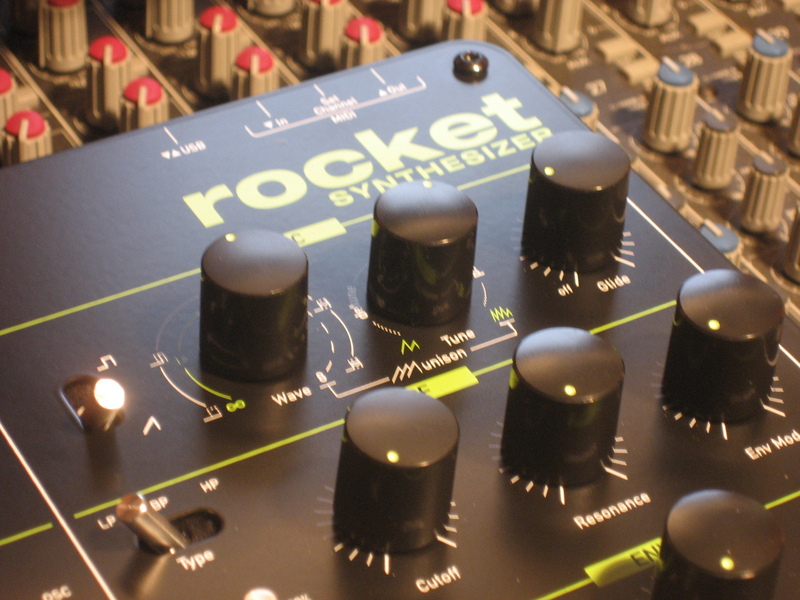 Right from the start, the Rocket displays a modern, thick and honest sound. 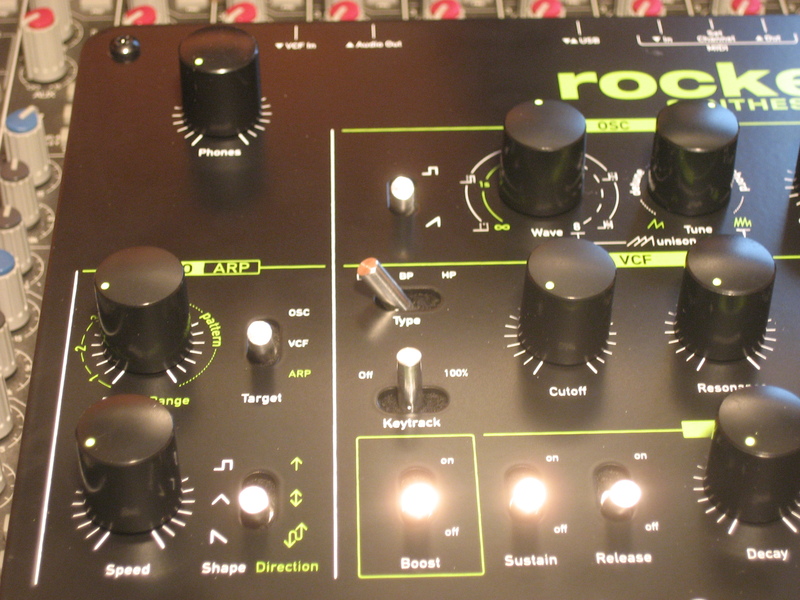 We like the versatility of the sole oscillator (its digital nature isn't bothering at all). The sound is clean from lows to highs, no digital artifacts are perceptible to the ear. The paraphonic mode is a nice surprise with its eight very wide and simultaneous sawtooths; once mastering the triggering phenomena of the sole envelope while playing chords, you will modify your playing style to get more natural results. 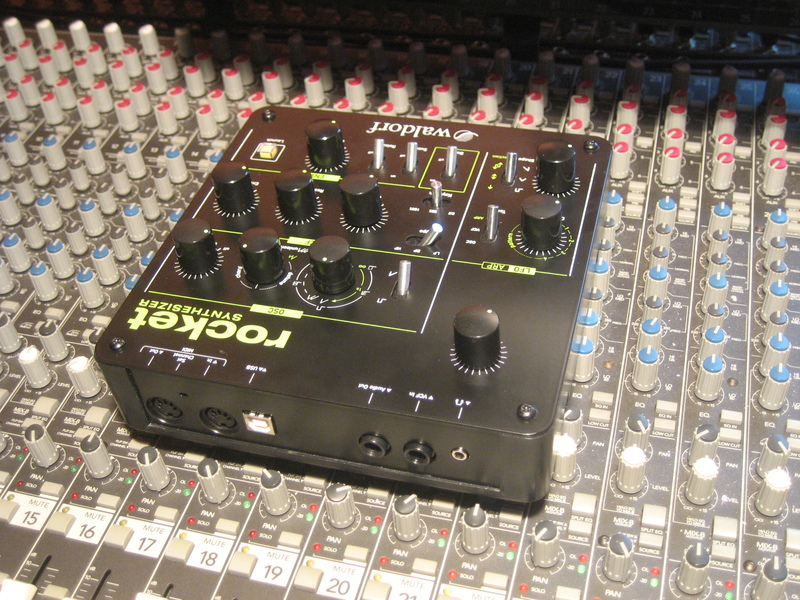 The multimode filter is very pleasant, with a nice coloration; we particularly liked the high-pass mode that maintains a very high audio level. The very marked resonance allows to create really twangy percussions — careful with the level! 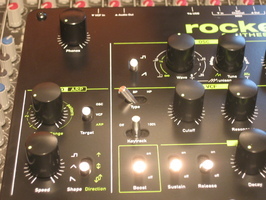 The Boost distortion dirties the sound in a rather unsubtle way, but that's what it is meant to do. A progressive gain dosage would've been preferable, especially to master better the paraphonic mode where distortions can be really intense. 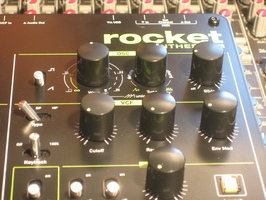 The Rocket connects to the digital world via MIDI and USB, over a channel to be determined. This allows us to remote control the Rocket, dump a program (in both directions) and update the OS. 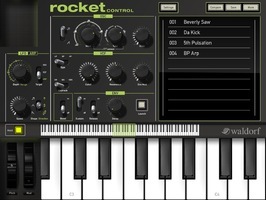 As of today there's only one free app for iPad, named Rocket Control. 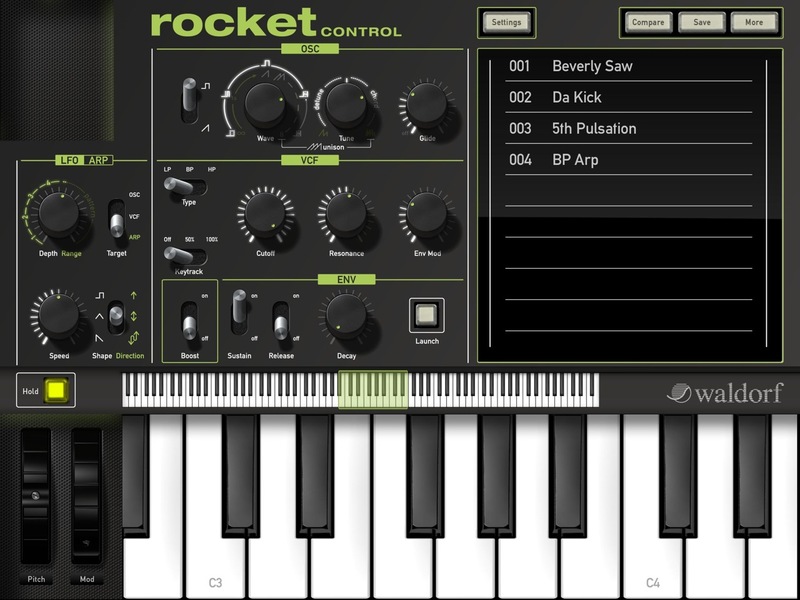 It allows us to edit sounds from the iPad (with an identical representation of the GUI), to play with a mini-keyboard and manage sounds. 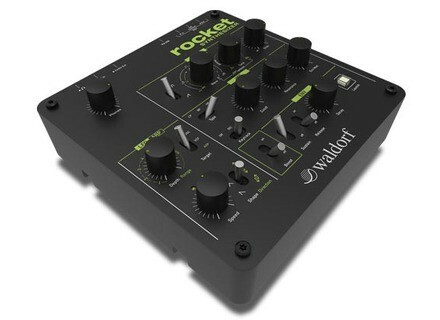 A flyer inside the Rocket's box mentions something about a VST plug-in whose LE version can be downloaded for free, but the unlock code doesn't work. For a handful of dollars you can make yourself with a standalone (stable and already available) or VST (in the works) editor here. With the sawtooth, Wave has a different role: from hard left to center, it controls the oscillator's sync time with an integrated fictional oscillator, while Tune controls the starting frequency of the slave oscillator; throughout the second half of the Wave knob, we can add progressively from two to eight sawtooths; Tune allows to control the detuning, create predefined musical intervals or switch to paraphonic mode; in this last case you can play a chord of up to eight notes. It's nice to have access to so many options with only one switch and two knobs, but the operation isn't the most comfortable. 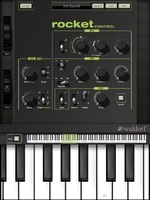 Glide allows you to control the portamento time between notes. 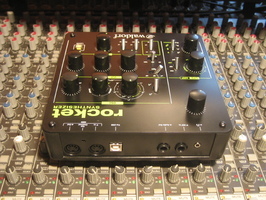 The output of the oscillator goes to the VCF, accompanied by the external signal from the audio input, given the case. Once again, the filter has nothing to do with the Pulse 2. It's a two-pole variable-state type resonant VCF multimode filter, while that of the Pulse 2 is a ladder filter. We have low-pass, high-pass and bandpass modes, sweet! The cutoff can be modulated by the key follow (0% – 50% – 100%), the envelope (positive modulation only) or the LFO. 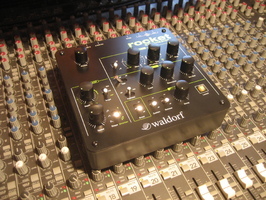 The speed controls the amount of envelope modulation. The filter can go into self-oscillation when we abuse the resonance. When the signal comes out of the filter, it can be distorted in the VCA section. And once again, this circuit has nothing to do with the Pulse 2. Both synths have certainly nothing in common, except for the OTA-based VCAs. The Rocket's only envelope is not very powerful: the Attack is fixed to 1 ms, the Decay parameter controls the decay and release times simultaneously (unless Release is set to off) and Sustain is a simple on (100%) / off (0%) switch. The envelope is pretty limited and, to be honest, we have seen better ones. 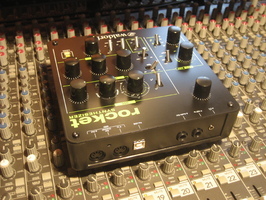 The LFO is very basic as well: three waveforms (square, triangle, sawtooth – so no S&H), a speed control (0.05Hz to 50Hz or MIDI sync according to different time divisions) and a depth control, which can be assigned to the pitch or VCF. Plus, there's a "hidden" vibrato that can be controlled with the modulation wheel; its speed can be controlled via MIDI CC only. 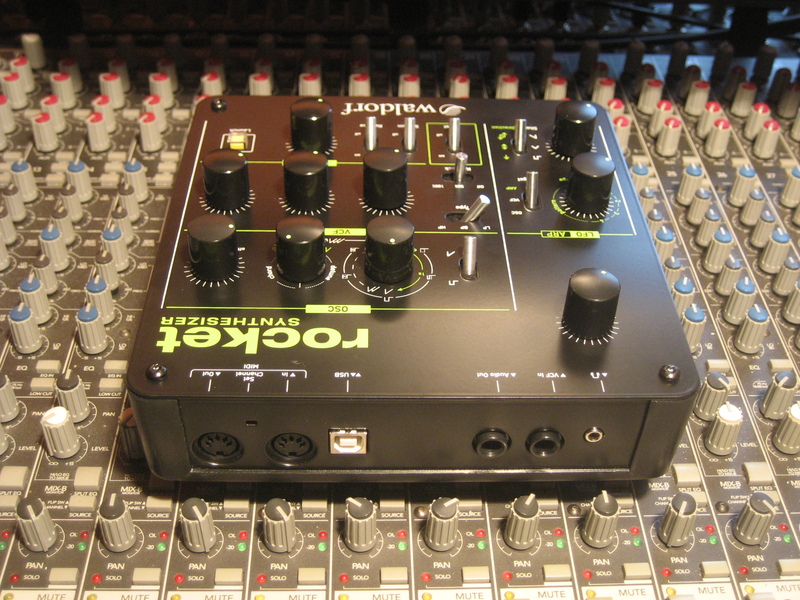 Alternatively, you can use a tiny arpeggiator instead of the LFO (they can't coexist). We can control its note range (one to four octaves), the playback direction (up, alternate, random… but not down!) or select one of the eight rhythmic patterns stored in memory. 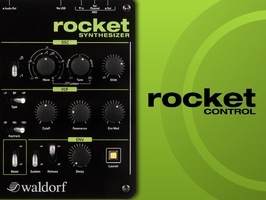 The Rocket is a nice module with a very strong character. 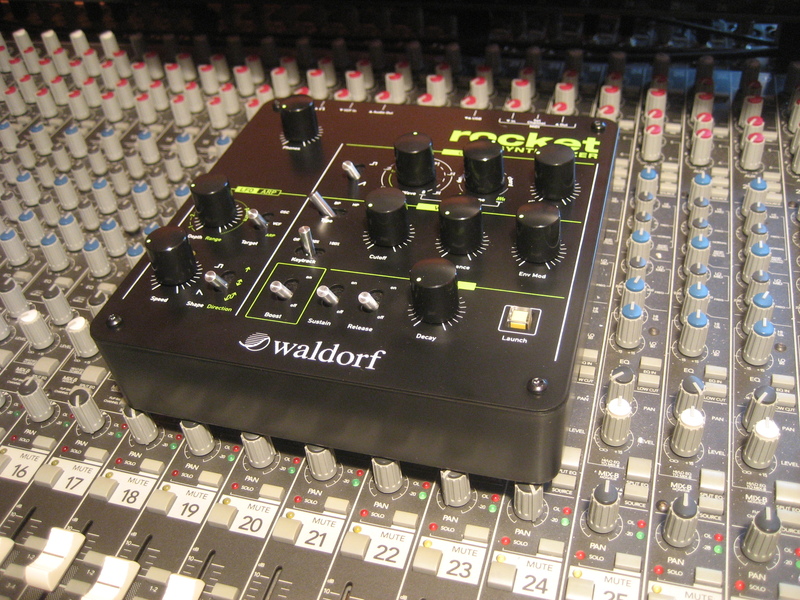 The original setting of the oscillator and the multimode filter form a nice pair of sound tools. The distortion is useful but a bit too strong in paraphonic mode. 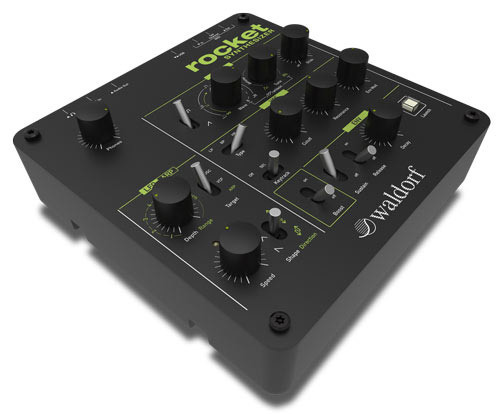 The modulations are without a doubt the Rocket's weakest point, as well as the limited connection options. For the price of a plug-in, it can provide live musicians with an original sound that, well-exploited, stands out from the crowd.